At New Roots Herbal, we are relentless in our aim to make the best natural health products in the world. To achieve this, we have an extensive staff devoted to quality assurance. With one of the most advanced laboratories in Canada, we are able to test over 800 ingredients using the latest in analytical equipment, employing a very wide spectrum of specialized and often specific methods. Our ingredients include herbs, vitamins, minerals, and nutraceuticals, as well as vegetable and fish oils. We test every single ingredient lot that comes in, without exception. Raw and finished product analytical testing is only one layer of quality assurance at New Roots Herbal. To ensure products’ adherence to all relevant Health Canada guidelines as well as labelling requirements, we employ numerous specialists dedicated to total quality assurance. They help ensure that what is on the label is what goes into the bottle. In addition, they ensure that all products meet all standards for safety and efficacy. 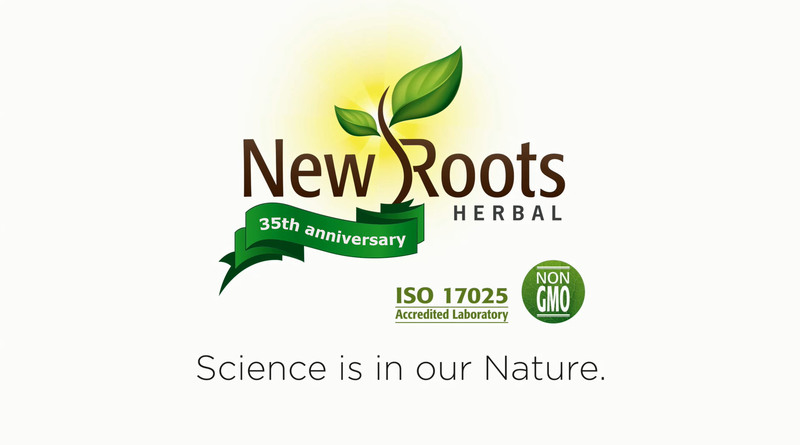 Quality control is intimately linked to the production of every bottle at New Roots Herbal. We have grown from 15 to 20 specialists in the laboratory, quality control, and quality assurance over the last two years. Professional training on HACCP (Hazard Analysis and Critical Control Point). Their extensive knowledge is applied to ensure the products you purchase from us are safe and of the highest quality available worldwide. Strong knowledge in United States, British, and European pharmacopeias, as well as ICH, GLP, and cGMP guidelines. Biotechnology, enzymology, chemistry, biodistribution, sterility, microbiology, and protein chemistry, and extends to many other specializations. Our team have strong backgrounds in procedural development of laboratory quality-management systems, and are proficient in qualitative and quantitative testing of ingredients and finished products. Our Laboratory Director is specialized in method development and validation of natural health products and dietary supplements. Our staff’s research has been published in several peer-reviewed journals. Our ISO quality-control experts maintain their knowledge at the leading edge by regularly attending seminars and training conferences. Furthermore, we maintain an internal program of training, which helps ensure quality is implemented throughout the company’s processes. All products developed are done so with the collaboration of naturopathic physicians and associated PhDs. We ensure products are free from contaminants and adulteration. Meeting the highest standards of identity, purity, and potency involves everyone at New Roots Herbal. On every level, we are committed to the manufacturing of the safest, highest-quality natural health products. To identify an ingredient is to ensure that the ingredient matches the species it is claimed to be; for example, this is borage oil seed and no other seed. Our testing always ensures that the ingredient matches the label. To confirm the potency of an ingredient is to ensure the ingredient is at the strength it is claimed to be; for example, grape seed will keep, contain, and meet the 95% proanthocyanidins label claim. Some products can go rancid with time. Our oxidation testing absolutely ensures our products maintain the highest levels of quality and freshness, as well as the lowest level of peroxide, all the way through to expiration. Capsules, softgels, and tablets must dissolve in the stomach; on the other hand, enteric-coated capsules, such as those of Acidophilus Ultra, must only dissolve in the intestines. Our disintegration testing mimics the human digestive system to ensure all products dissolve at the right place and at the right time. The Earth is permeated by natural levels of heavy metals. Ground crops are especially susceptible. Our testing guarantees the safety of our products. These chemicals are dangerous and can contaminate ingredients at any stage. We work only through our relationships with trusted suppliers. That said, our testing absolutely ensures our products are free from these contaminants and their dangers. Testing only for microbial contamination is not enough. Our testing guarantees our products are free from microbial contamination, as well as any residue these bacteria can produce. We invest over 600 hours per week testing thousands of ingredient samples prior to inclusion in every New Roots Herbal product. All ingredients are tested for identity, purity, and potency to verify the accuracy and integrity of every certificate of analysis. Our industry-specific scientific team employs advanced analytical equipment to examine the fingerprint of all the constituents of ingredients rather than only specific marker compounds. This permits us to truly determine the specific genus and species of every ingredient, to confirm identity as well as potency for specific compounds that deliver therapeutic benefits, as well as freedom from contaminants. The body of work being compiled within our analytical lab allows us to acknowledge seasonal and geographical variability of natural products, yet is also precise enough to recognize adulterated or spiked ingredients. You can truly say that science is in our nature! Our products undergo strict quality assurance. We blend traditional formula remedies with the latest scientific advances in vitamins, botanicals, nutraceuticals, special extracts, and isolates. All ingredients that enter our facility are tested three times over for identity, contaminants such as mycotoxins (aflatoxins), PCBs, over 80 different pesticides, heavy metals, microbiology (bacteria), mould, and fungus. Most importantly, we validate the potency. All these tests are conducted at our state-of-the-art, 3400 sq. ft. laboratory staffed with 15 scientists, including 6 McGill University graduates. The laboratory is staffed by 3 PhDs, 4 MScs, and 8 BScs, who devote over 600 hours of testing and research weekly. Our sensitive, high-technology instruments have a greater sensitivity than older scientific testing equipment. 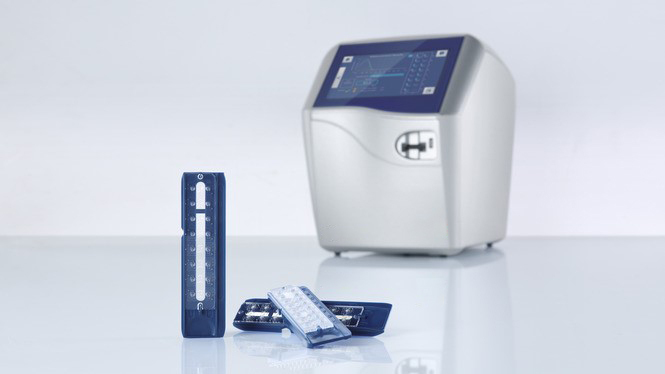 With these sophisticated instruments, we achieve the most precise test results possible. Our sophisticated instruments and personnel allow us to perform extensive testing of our products. These tests ensure the safety of our products and their compliance to label claims. Many products can be tested using different instruments, but for simplicity, one instrument is typically preferred over another. Some instruments are better at analyzing water-soluble products (such as vitamin C), whereas others are more suitable to oil-soluble products (such as fish oil or vitamin D). The HPLC is a master specialist in determining the identity and quantity of elements and molecules, such as the activity in an herb, the product of an enzymatic reaction, or any molecule which absorbs light or that can be made chromophore (able to absorb/transmit light). The HPLC is very specific in being able to absolutely determine what a substance is and exactly how much of it there is. HPLC works by automatically injecting a small volume of liquid sample into a column packed with particles 1⁄20 the thickness of a white sheet of paper. The liquid sample is forced through the column by powerful micropumps. 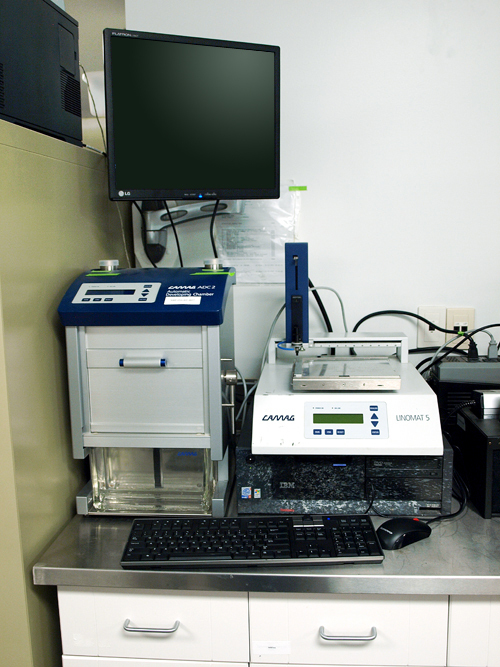 The detector sends a digital signal to the computer, where specialized software is used to identify and determine the quantity of the separated components. We use it routinely to analyse the composition of compounds present in complex mixtures, such as water- and fat-soluble vitamins. 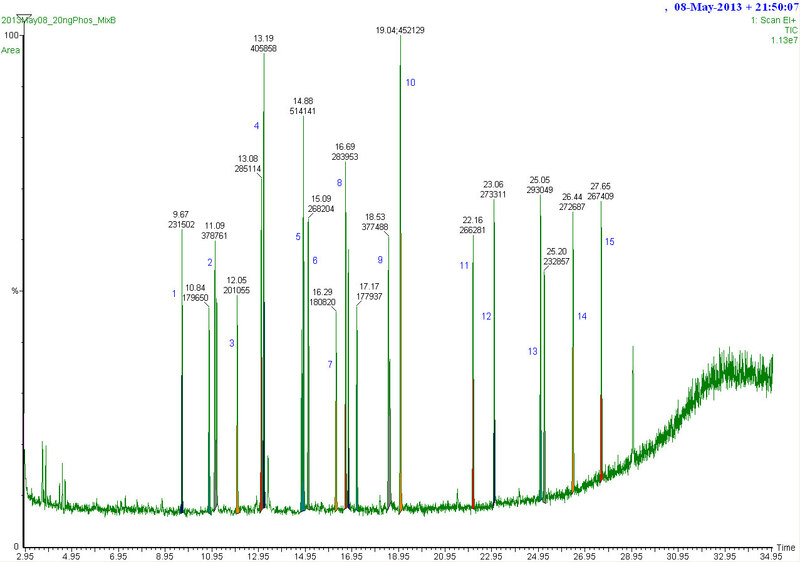 We also use the HPLC to analyse a large variety of ingredient, for example astragalus, dandelion, and red clover. 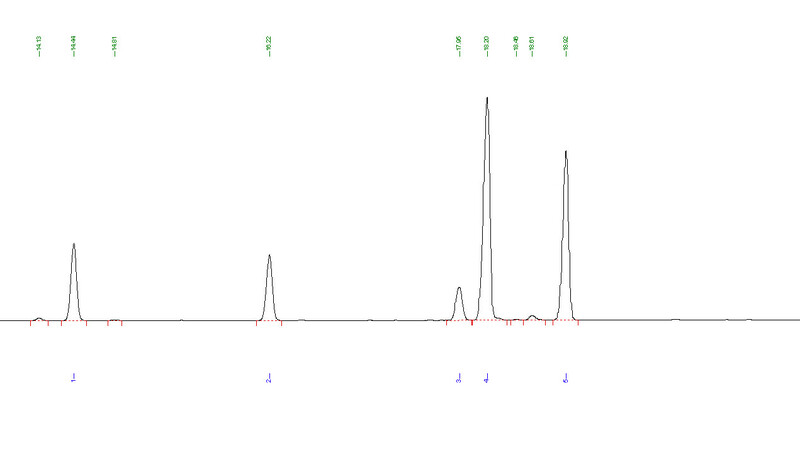 This is a typical liquid chromatogram of water-soluble vitamins; these are called chromatographic peaks, and each one represents a separated compound. We’ve added 4 UHPLCs to our laboratory. These extend our extensive testing capability. 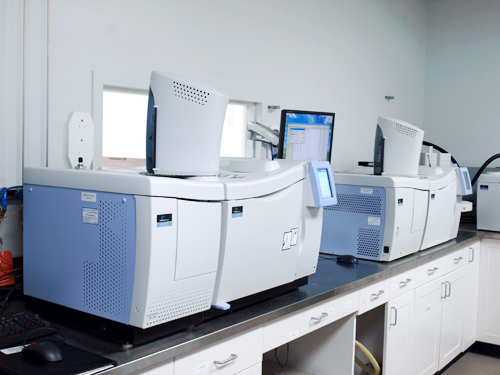 Our laboratory has also added DNA extraction and analysis capability. With this capability we can identify if an ingredient contains any GMO DNA or proteins. 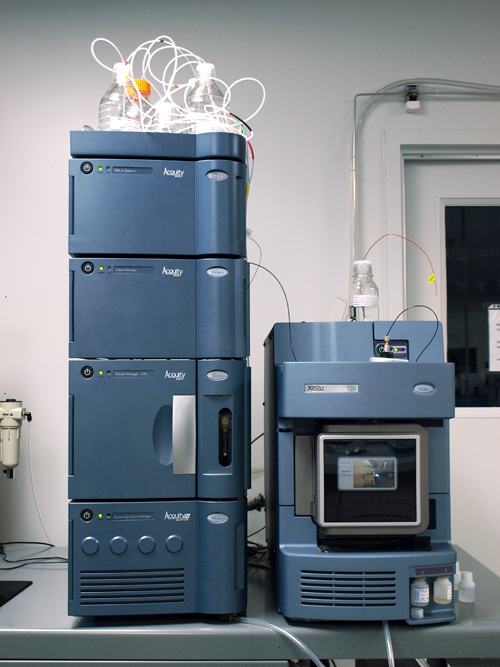 If the HPLC is the master specialist in identifying and quantifying, then the LC-MS/MS is the all-star. It is able to do everything the HPLC can do, only better and more precisely. It does this by using a very high-pressure micropump—15,000 psi—,combined with dual detector / photodiode array (PDA) and a more powerful mass spectrometer detector. It is used in cases where extreme sensitivity is needed. Currently, this is the most advanced and widest-application tool for analysis. It allows for the most precise measurements—in parts per trillion rather than billion or million… The LC-MS/MS is able to effectively analyse herbs and medicinal components. 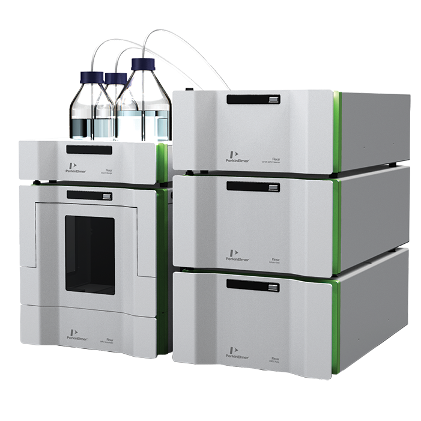 The LC/MS combines the advanced separation capabilities of an HPLC with the powerful analytical abilities of a mass spectrometer. A sample is injected into the UPLC system and separated into its various components. These components enter the MS through an “electro spray interface,” where very rapid ionization takes place. 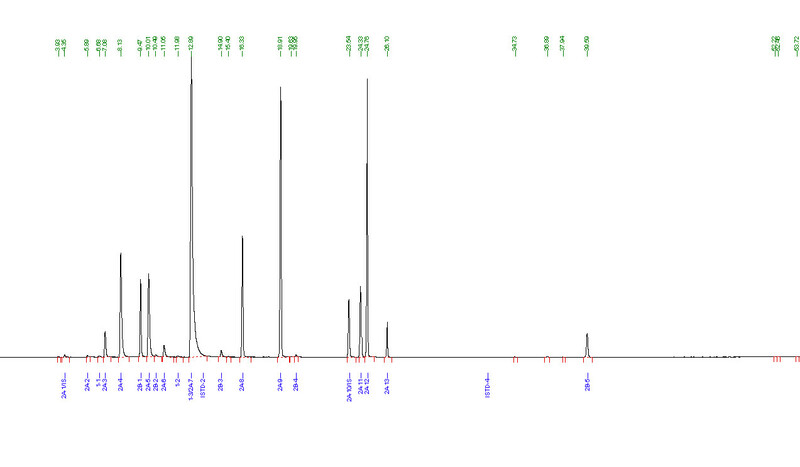 At this point, the mass spectra of the components can be used to pinpoint-analyse the sample. The main advantage of this system is that it generates fast, accurate, and extremely precise measurements by creating an electronic signature of a compound. We test many nutraceuticals with this instrument, such as glycosides in black cohosh, thujone in worm wood, and residual antibiotics in royal jelly. The GC is used to analyse volatile molecules with a high melting point, such as fatty acids in fish oil. 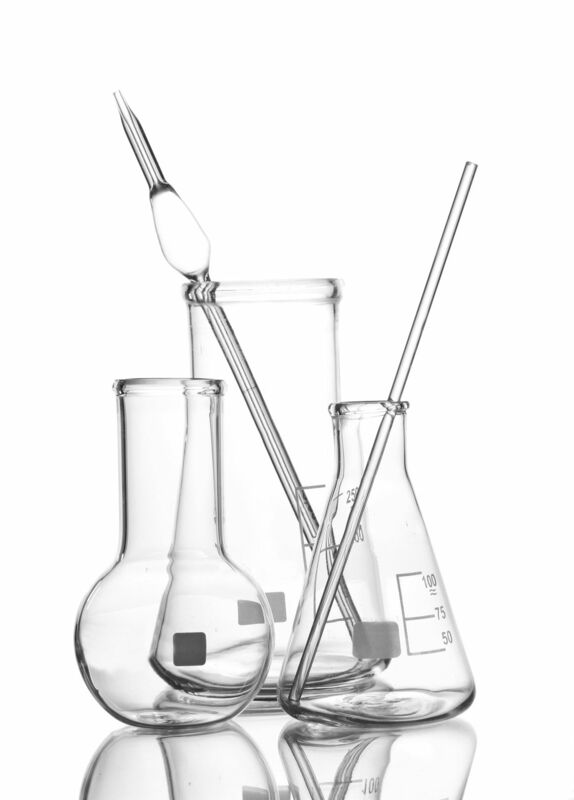 In addition, samples submitted to the GC do not need solvents or a “liquid mobile phase”; instead, samples are carried by an inert gas through the system. Hence, if we are testing for solvents, the instrument of choice is the GC-FID/MS; no steps are needed to factor out any solvents used to prepare the sample. GC-MS is precisely able to identify and determine the quantity of the molecules of interest, whereas GC-FID is only used to determine the quantity of molecules. Like LC-MS/MS, GC-MS is also able to create an electronic signature of a molecule. The complexity of running the test will dictate which instrument will be used. In a GC system, the vaporized sample is moved with a carrier gas through a specially coated capillary column. The column separates the components before entry into the detector; in our case, either the FID or MS, depending on the application. We also use the GC-FID system to determine the quantity of common fatty acids and essential oils present in oils such as tamanu, argan, and fish oil. This is a typical fatty acids chromatogram of an argan oil sample. PCBs and pesticides are tested for through the GC-MS. As the samples pass through the ionization chamber, they are bombarded with a very high voltage of electricity that results in complete fragmentation (separation) of the individual compounds. The fragments are reconstructed as they move through a vacuum tube as per their mass-to-charge ratio. The given signal is recorded by the computer for analysis. The compounds are compared with a well-known library from the National Institute of Standards and Technology (NIST) or a certified reference standard material. The total ion chromatogram below represents a pesticides mixture. Samples being tested for solvents pass through our headspace GC-FID. The FID incinerates the sample, giving an electrical signal for analysis. We use this setup to detect if there are solvents, such as 1,2-dichloroethane and 1,1,1-trichloroethane—which are known human carcinogens. These contaminants can be present in low-quality herbal extracts, and we have zero tolerance for them. The chromatogram below represents residual solvent. 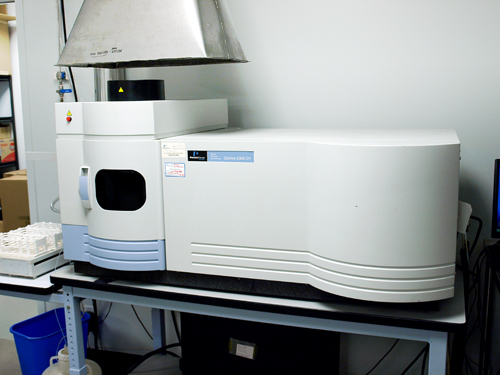 ICP specializes in analysing metals and minerals. With this device, we can effectively and precisely determine the identity and quantity of any metal present in a sample, be it iron, magnesium, lead, mercury, or boron. The process to test for these metals is much more straightforward than it would be on the HPLC or LC/MS. With an ICP-OES, a sample flows into a plasma torch, where it is incinerated into atomized particles. Electrons of the atomized sample go through different levels of energy and by doing so, the atoms emit light; that light is analysed for meaningful information. We use it to detect contamination by low-level trace metals—including mercury, arsenic, lead, and cadmium. These contaminants permeate the Earth’s crust and can be especially present in foodstuff grown in the ground or any items originating from the earth. Essentially, the only remnants of an atomized sample will be any residual metals, which we are then able to detect. This makes methods developed to test metals easier to run for on the ICP. 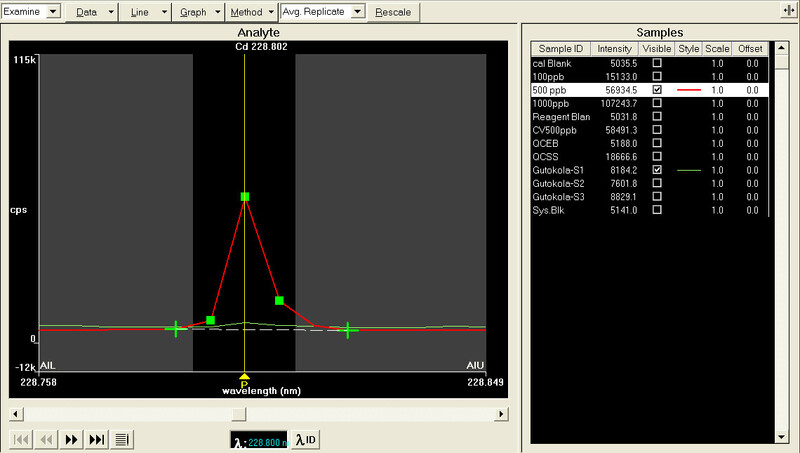 Here is an ICP screenshot of the spectral view of cadmium. 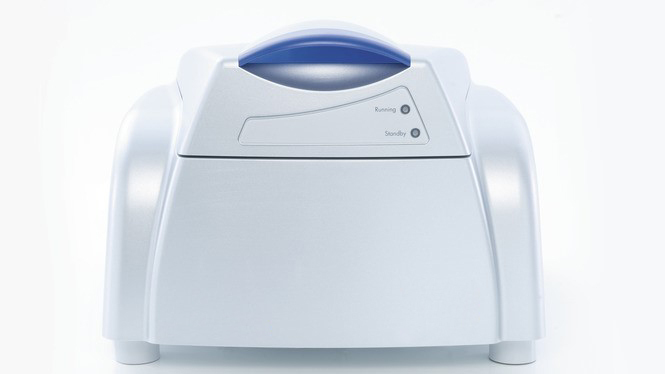 The spectrophotometer is a cost-effective tool that can be used to determine the quantity of samples which absorb or transmit light. Based on absorption or transmittance of light, a correlation can be made to determine the quantity of a substance. The identity of the sample will be determined through other instruments. 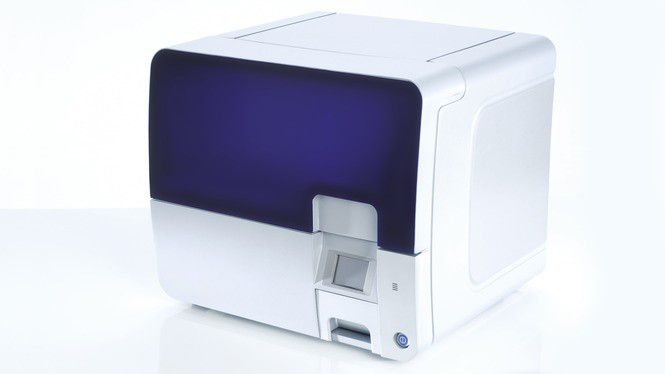 A spectrophotometer is a device used to measure light intensity. NASA typically includes a spectrophotometer on their interplanetary landers such as the Spirit and Opportunity rovers. A small beam of light passes through the sample; some of the light is absorbed, but what passes through is detected and measured by the spectrophotometer. We are able to use this information to determine the quantity of a substance. 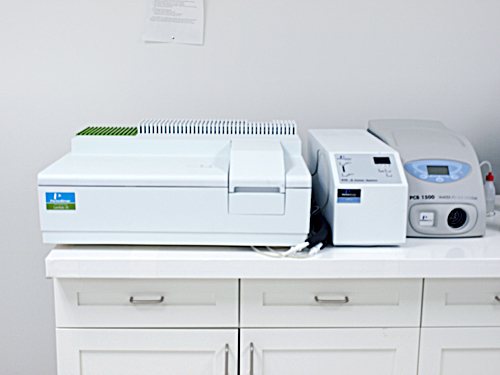 Our spectrophotometer is used to determine some enzymatic activities, such as papain and bromelain, or anthocyanidin content in bilberry. Here is a screen shot of a spectrophotometer graph of a papain sample. The HPTLC is an effective tool to verify the fingerprint of identity of ingredients against a reference plate. We are able to confirm the profile of a plant thanks to this tool, and to ensure the right ingredient is being used. With an HPTLC, individual components of a mixture are separated on a thin glass-coated plate, which is then placed in a developing chamber. The TLC plate is placed under an ultraviolet lamp, and bands of the different components are visualized. Unlike a standard TLC, with an HPTLC many tasks are automated via robotics, eliminating uncertainty from samples being applied to plates by hand. We use the HPTLC to detect if products have been contaminated by mycotoxins, a dangerous class of toxins that can develop on plant matter in humid conditions. You can see an HPTLC plate below. NIR can be used to test a wide variety of substances; herbs and isolates such as amino acids. NIR can test almost anything, so long as we have a sample known to be that substance. With this device, we can guarantee the freshness of the plants we use in your product. NIR works by comparing the fingerprint of a substance with an average of fingerprints of samples known to be that substance. Those fingerprints form a 3D reference model of what is acceptable. This is important, as even grown under similar conditions, the same plant will not grow in an identical fashion. NIR allows us to identify herbal products’ total quality. We ensure that only those samples that meet our strict criteria for freshness and quality are able to pass. We only include the highest-quality herbals in the reference models we create for the NIR. 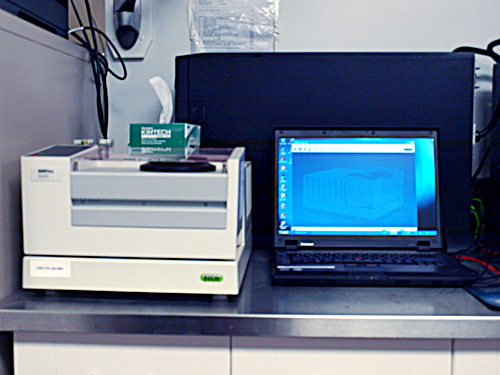 The NIR gives a reliable identification of a sample by comparing its spectra to the spectra of a sample of known characteristics. NIR analyses the transmissive properties of specific wavelengths of light in the sample being measured. 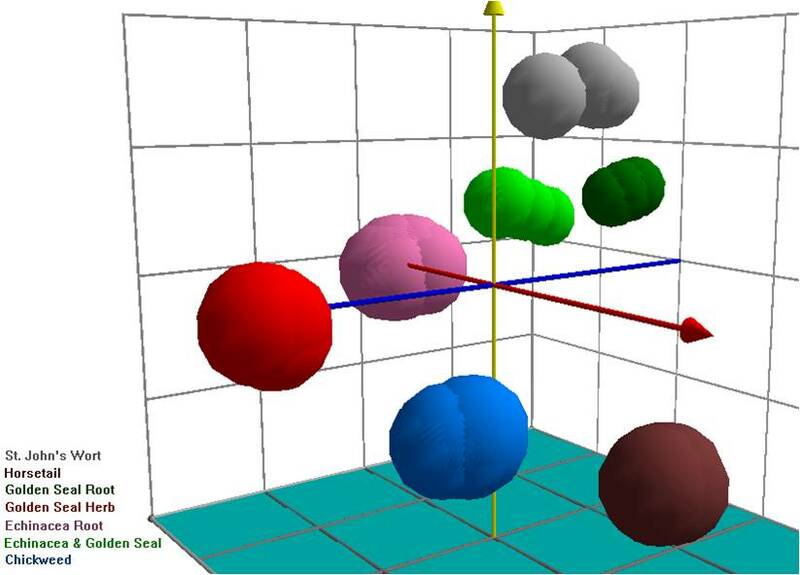 Here is a representation of spectral information into a three-dimensional image. 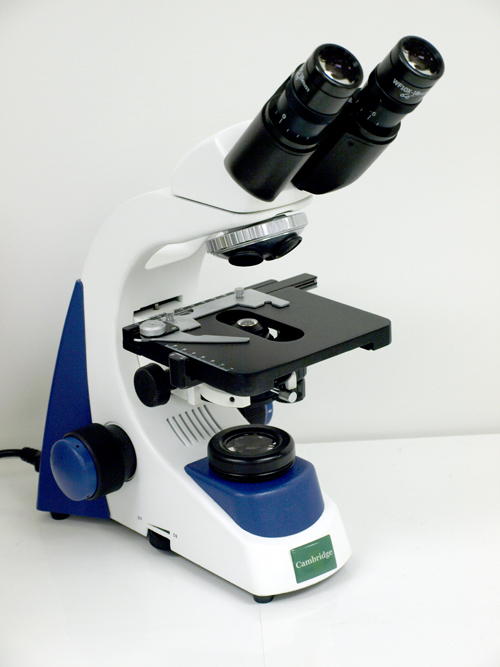 The venerable microscope is still a staple in any laboratory. Of course, we use a modern light microscope; this style of microscope utilizes a focused beam of light that is converged by the condenser lens onto a specific point on the specimen. 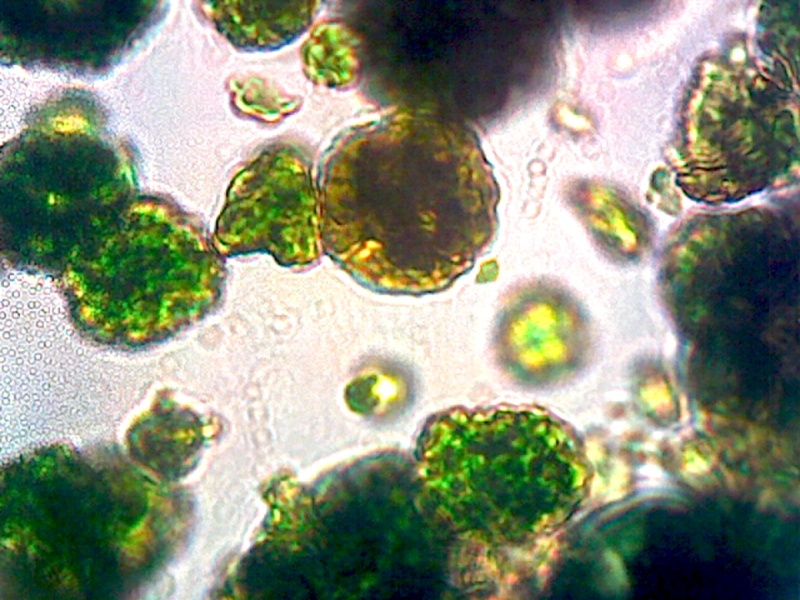 We use it to examine the broken cell status of Chlorella samples. Here is an example of a broken cell wall in a Chlorella sample; broken cell walls make for easier digestion and absorbability. 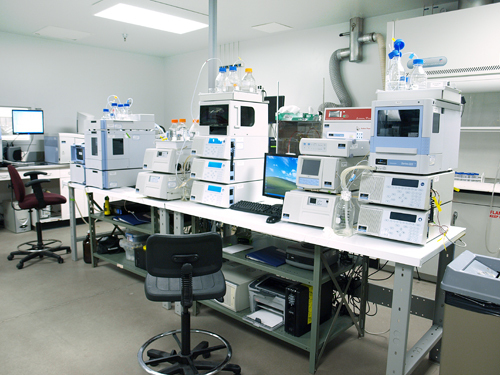 The laboratory includes 4 HPLCs, 4 UHPLCs, 2 GC-FIDs, 2 GC-MSs, 1 headspace, 2 spectrophotometers, 1 ICP-OES, 1 UPLC-MS/MS, 1 HPTLC, 1 NIR, and 1 microscope as well as a DNA extractor/purifier, DNA quantifier and a real time PCR unit. We employ 3 PhDs, 4 MScs, and 8 BScs, who each work 40 hours a week, totaling 600 hours of tests and research on a weekly basis.